1. Diabetic Socks aim to meet the special need and provide extra foot care for diabetics. 2. Every feature is designed to comfort the sensitive feet of diabetics. (1) Loose-band design: prevent rubbing and itching. (2) Acrylic yarns: moisturing and cool. (3) Non-constricting & mild gradient compression: keep the socks in place to prevent sliding. (4) Additional padding: provide extra comfort and reduce friction. (5) Toe seamless weave to reduce friction. 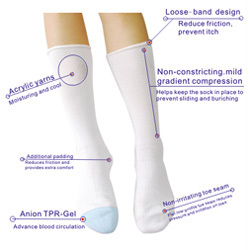 (6) Feet covered with anion TPR-Gel: makes walking comfortable. Anion helps to advance blood circulation; TPR-Gel was made of 80% mineral oil to moisturize skin. (7) Unique know-how of combining TPR-Gel with textile. 1. Contents: 80% cotton ; 20% spandex. 2. Color: white. 3. Size: female, male. 4. Origin: Taiwan.